I recently spent a weekend in Madrid and was unfortunate enough to encounter problems on my return flight to Germany with Spanair. First there was no-one at the gate a boarding time, and when they did arrive they were unable to operate the boarding-card reader. Eventually we boarded by showing our cards without the stubs being torn off. The delay caused the flight to miss its slot and subsequently took off almost an hour late. This hour turned out to be crucial, as there were heavy thunder storms over Frankfurt airport as we approached, which meant that the flight was diverted to Stuttgart. Eventually the storm cleared and the plane was re-fuelled. It flew back to Frankfurt, so that instead of arriving at 21:05 I reached the terminal at 00:15! Some passengers on the flight had already asked about compensation, but were told that the usual rules were not applicable as the delay was due to the weather conditions. BUT had the flight taken off on time, it would have reached Frankfurt before the airport was closed. I filled out the relevant complaint form (EU Regulation 261/2004) and sent it off to Spanair. Their German office told me that I had to send it to the head office in Spain! “With relation to the above mentioned flight we have verified that it could not be operated as scheduled. The delay was caused due to bad weather conditions. 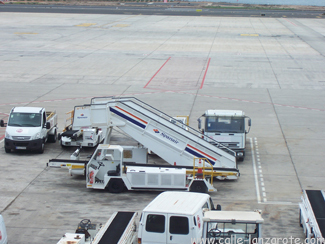 Spanair, as contracted carrier, complied with the undertaking of transporting the Passengers to their destination, using its best efforts to minimise the delay until the flight could depart. There were passengers who wanted to leave the plane in Stuttgart to get to their destination, but although they were eventually allowed to leave the plane (without their luggage), any other questions about how we were all going to get home were met with “Keine Ahnung” (“no idea”) until the pilot eventually made the announcement about the re-fuelling. But what I find really cheeky is putting the delay entirely down to the weather in Frankfurt! I have replied saying that I do not accept this answer, and have asked them to explain the delay in Madrid, but as yet – 2 weeks later – I have not had a reply. What I have found is a very interesting site called flightstats.com, where you can view flight information even weeks afterwards. 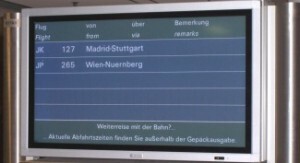 It is clear that my flight not only departed the gate 50 minutes later than scheduled, but that according to the arrivals board if we had not been delayed in Madrid, then we would not have to have been diverted. Is this Spanair’s idea of customer service?